If you don’t have a habit tracker in a bullet journal, notebook, journal, or a spreadsheet you are missing out on an extremely useful tool. Habit trackers help us to stay on track to meet goals. The act of filling in your completed habits daily helps to motivate you to accomplish and build healthy habits. I use habit trackers mainly for business. However, you can easily use a habit tracker for literally anything you want to track. 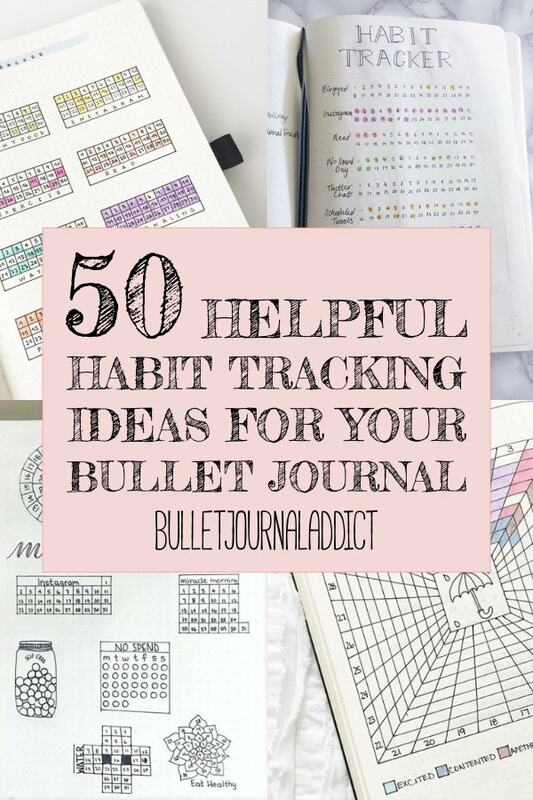 Not only have I gathered a bunch of layouts for bullet journal habit trackers, I’ve also put together a list of 50 ideas for what habits to track in your bullet journal. Take a look at some of the beautiful habit trackers below to help you figure out how you want to set up your bullet journal habit tracker. Remember your habit tracker should work for you, you don’t need to copy completely and you can modify them any way you want. That is the beauty of using a bullet journal. I love these mini habit trackers. You can make them look like little calendars or mandalas. You can fill them in with different colors the goal being each one gets filled in daily till they are completed. You’ll be proud once they are completely filled in. For those who don’t have a lot of creativity or just need a simple layout to track their progress this minimalist approach is clean and easy to do. Just highlight or color in the dates of the accomplished habit daily. Check out my post 14 Perfect Bullet Journal Spreads. I love the look of this clean habit tracker. Easy to duplicate but effective in building those healthy habits. Each habit having a it’s own box allows for easy tracking in a neat and tidy way. I love how this habit tracker allows for you to block out days that you may not be able to accomplish a certain habit. Travel, appointments, and other life events can often through your habit building for a loop. Using a habit tracker in this way allows you to not feel overwhelmed on busy days but keep you on track when your schedule returns to normal. Turning your habit tracker into a fun design idea is extremely pleasing to the eyes. Not only does the rainbow of colors create a finished product that is beautiful you can see where you need to work on things as well. Turn habit tracking into a fun hobby like this and you will find success. Check out my post 11 Bullet Journal Cleaning Schedules. This simple habit tracker is an efficient way to track your habits daily. An easy to duplicate and non complicated approach to habit tracking is great for busy or minimalist people. While it would take a bit of time to set up this habit tracker is an effective one. As you fill in the squares throughout the month you can see what your mood was like while doing them. This could help you to decide which habits are worth it and which ones you might want to ditch in the future. The goal is to build healthy habits that also help improve your mood and well being. Now that you see how you can set up the layout of your habit tracker lets take a look at some habits to track. Below is a list of 50 bullet journal habit tracker ideas to track. Everything from self care, home care, to even business. Check out my post 19 Beautiful Weekly Spreads For Your Bullet Journal. Tracking your habits is one sure fire way to make sure you build healthy habits that will keep you on track for success. If you are new to tracking habits the hardest part will be looking at your habit tracker daily to fill it out. Try leaving notes or making it a part of your nightly routine before bed. I fill mine out over a cup of tea before I go to bed. Check out my post 11 Bullet Journal Health Tracking Spreads. Remember it takes 21 consecutive days to make or break a habit. Start small by only picking a few habits to track at first. After you master those habits and make them a part of your daily routine you can start adding more or building on the habits you’ve now mastered. Starting or breaking a habit is difficult, a habit tracker is a sure fire way to make sure that you are successful. What habits are you looking forward to creating? Let me know in the comments below. Do you have bullet journal spreads you would like shared? Email them to [email protected] and they may be featured on an Instagram post and/or to the blog. Please leave your IG Username so I can tag you in the posts. Follow me on Pinterest for more like this and pin this to your Bullet Journal boards. I was working on my first bujo and I didn’t know how to make the habit tracker. So I looked up on the internet and my eyes were caught by this website. And I find it really helpful and inspiring. I love the habit tracker inspirations too! The habit tracker ideas to track was very helpful so I can see what I need to track on my habit tracker. Thank you so much for the post!